EA Sports Cricket fans are you looking for Vivo IPL 2018 - 11 "T20 Slog fest" Patch for Cricket 07? Yes you have come to the right place. Download here the most anticipated, the most high profile t20 Patch for your favourite Video Cricket game, EA SPORTS Cricket 07. 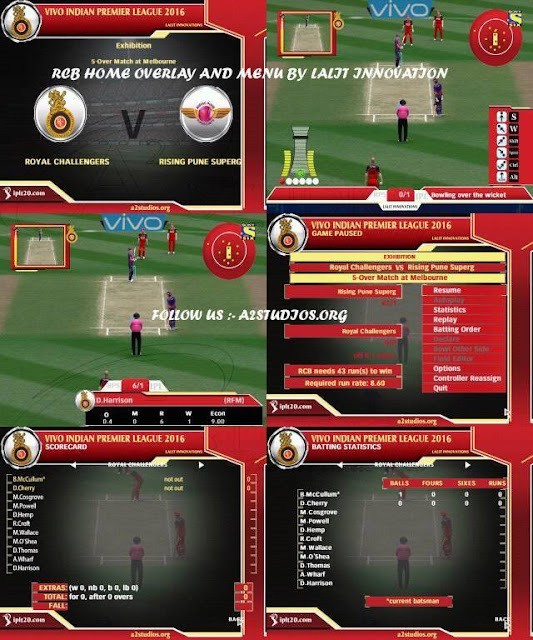 This patch changes the whole look of Cricket 07 with real kits, team logos, new updated squads and line ups of all Vivo IPL 2018 Teams for 2018 Edition, realistic Overlay and pause menu, best modeled stadiums by legendary modders, main menu graphics, ultimate gaming experience, standing pitchads and blinking type flashing bails and stumps and much much more! Words would not do justice to the hype is created for this years Mega IPL Mela. 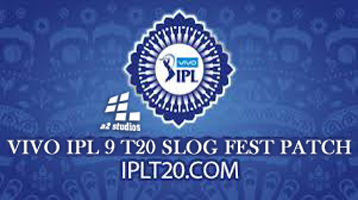 This years IPL patch has been named the slogan of "T20 Slog fest". The name is quality so is the brand! a2 Studios has done the finest job in making IPL Patches on yearly basis for each edition! Here are earlier patch editions of Indian Premier League. You must have EA Sports Cricket 07 video game in your personal computer. Extract downloaded Patch Rar file anywhere in your computer. Run 'Vivo-IPL-9-Patch.EXE' install it in EA Sports Cricket 07 Installed Folder. Go to Games Modes > Domestic > Indian Domestic > Vivo IPL 11 > Choose 2018 Fixtures & 20 overs. Start Playing! How excited are you for this year's Vivo IPL 11 T20 Slog fest 2018 Patch for Cricket 07? KumarStuff Willow 256HD Batpack 2017 NOW ERROR FREE!! -Downloader's Manual (in PDF Format) which provides detail info and instructions in an interactive manner. Use the EXE file to install the BatPack and follow On-Screen instructions. You need to accept the License to proceed towards Installation. (Refer the Manual for more info). An XML file is provided to use with the PlayerEditor. Use it to assign the Bats. Detailed additional information and instructions are given in the Manual. This BatPack contains 256 HD Bats of all popular Manufactures which are using in International Cricket Borads & Association etc. Click on the .EXE file to Install the Kumarstuff256BP.exe, accept the license. Then browse to your EA CRICKET 07 ROOT DIRECTORY and REPLACED it by old one. Create a new folder on your computer and install the contents from the Kumarstuff256BP.exe. Now Copy all these extracted files to EA CRICKET 07 ROOT DIRECTORY and REPLACED it by old one. Thank You for downloading this Batpack With this you can make your game more realistic. The batpack is totally free for personal usage. Storage of the content of package on any media for the purpose of redistribution is strictly prohibited. Hero Caribbean Premier League T20 2017 (CPL T20 2017 Patch for Cricket 07) now available for Download. Download now Hero CPL T20 2017 Patch for EA Sports Cricket 07 now. If you want the most authentic experience of the cricket in Caribbean, feel free to download A2 Studios Caribbean Premier League 2017 Patch (CPLT20 Patch 2017 for Cricket 07). This Patch comes with high quality kit bags patch, high definition logos, all teams accurate squads in CPL 2017 roster patch, totally assigned realistic face, overlays and menus patch, authentic fixtures, standing pitchad and LED Stumps and much more. This CPL Patch 2017 Edition will prove to be a revolution in Cricket 07 history. Test yourself then believe! LATEST kits assigned correctly for ALL Six CPL teams. Realistic looking stadiums modified and created! HD Pitchads, LED stumps and outfields! Run 'CPL17Patch.EXE' install it in EA Sports Cricket 07 Installed Folder. Go to Caribbean Premier League > Domestic > West Indies Cricket > Caribbean Premier League > Choose 2017 Fixtures & 20 overs. Hello A2 Studios fans, we bring you the hot ICC Champions Trophy Patch 2017 for EA Sports Cricket 2007. The patch is completely free of cost & easy to download for our fans. ICC Champions Trophy 2017 Patch contains High Quality Kits of all 8 participant teams, beautifully modeled and textured stadiums, incredibly HD Logos, overlays, realistic faces of all players, up to dated squads of all teams, and much more. Mouthwatering! Isn't it. So just download the patch & read out the instruction of how to install the patch. LATEST kits assigned correctly for ALL 8 Champions Trophy teams. Run 'CT17Patch.EXE' install it in EA Sports Cricket 07 Installed Folder. Go to ICC Champions Trophy > International > ICC CT 2017 > Choose 2017 Fixtures & 50 overs. Start Playing! EA Sports Cricket fans are you looking for Vivo IPL 9 "T20 Slog fest" 2016 Patch for Cricket 07? Yes you have come to the right place. Download here the most anticipated, the most high profile t20 Patch for your favourite Video Cricket game, EA SPORTS Cricket 07. This patch changes the whole look of Cricket 07 with real kits, team logos, new updated squads and line ups of all Vivo IPL 9 Teams for 2016 Edition, realistic Overlay and pause menu, best modeled stadiums by legendary modders, main menu graphics, ultimate gaming experience, standing pitchads and blinking type flashing bails and stumps and much much more! Words would not do justice to the hype is created for this years Mega IPL Mela. 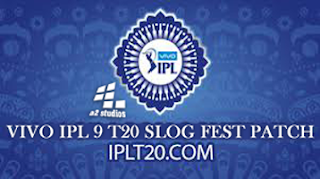 This years IPL patch has been named the slogan of "T20 Slog fest". The name is quality so is the brand! Go to Games Modes > Domestic > Indian Domestic > Vivo IPL 9 > Choose 2016 Fixtures & 20 overs. Start Playing!